Hello hello hello! I'm back from a long weekend in the desert! It was full of best friends, a fur cladded pool, lots of sun, and a prickly cactus that got stuck in my shoe. I just downloaded my photos and will work on a little Joshua Tree post to share with you guys soon! I'm back home in chilly San Francisco burrito-ed up in my blanket trying to fend off icky germs from flying. I have 5 more flights to take over the next 2 weeks, so I'll be chugging emergen-c and ginger shots for the near future. Let me see... what is there to update you on?? 1. Reuben and I watched The Office in it's entirety in just 5 weeks. Is that insane or impressive? Both? The Office was something I just never got into before, but now it is my favorite show of all time. It's the most perfect show. It's hilarious, it's offensive, it's real, and it's so incredibly sweet. Gosh. I just tear up thinking about how much Jim and Pam love each other. After we watched the last episode it was weird... like, what is there even to watch now? 2. Reuben got me hooked on the latest season of American Idol. So we quickly found something new to obsesses over. The production value of this season is so impressive! Lionel Richie is such a pleasant person! Plus there are countless touching contestant stories, so I still have something to keep me crying every other day. Not that that is hard. 3. Our apartment is going to be the home to a banjo soon. Our neighbors are going to love us. 4. I'm a confident bao maker now. The first time I ever steamed bao dough it was not good. It was bad. They had a weird flavor and didn't really fluff up. Who knows what happened. But after some practice, I got it down! These fried chicken sliders were inspired by a recent trip to Chick-Fil-A (lol) and a fancy dinner at Liholiho Yacht Club. Just like The Office, I never really got into the hype of Chick-Fil-A. But there is one right by one of my projects, so after some really stressful days it was the perfect eat my feelings pit stop. The bao sliders at Liholiho Yacht Club are filled with grilled beef tongue, peanuts, pickled cucumbers, and some spicy sauce. Their buns are also crusted with poppy seeds, which adds a nice texture but also an awful mess to clean up later. You have been warned that if you go the poppy seed route, you're going to be finding poppy seeds everywhere for the next 3 days. So I guess you could say these sliders are a Chick-Fil-A and Liholiho Yacht Club lovechild! To make these sliders, you can purchase your own buns at your local asian market or bakery. But I really do love a freshly steamed bun! The buns are super light and fluffy, but have the integrity and structure to support a crispy slice of fried chicken. 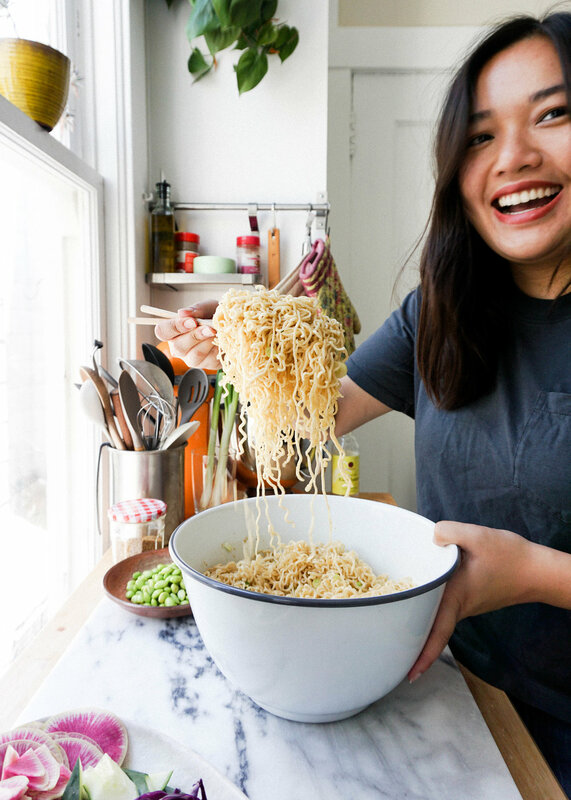 I highly recommend that you add some kimchi, slice cucumbers, hoisin, and Sriracha for that crunchy, sweet, salty, tangy, and spicy thang. SO GOOD. How do I get in contact with Chick-Fil-A product development reps?! 1. Mix yeast, warm water, and pinch of sugar in a small bowl. Set aside for 5 minutes to activate the yeast. You should see a few small bubbles. Whisk in oil and set aside. 2. Combine baking powder, sugar, and flour in a large bowl. Create a well in the middle of the flour and slowly pour in the yeast mixture. Slowly stir the yeast mixture into the flour mixture with a wooden spoon or with you hands. Keep stirring until you have a ragged dough. Add a few teaspoons of water if the dough still feels a little dry. Gather your dough into a rough ball on a clean work surface and knead for about 5 minutes. Dough should be smooth and elastic. 3. Grease a large bowl with a bit of oil. Place dough ball in the bowl and over with a damp kitchen towel or plastic wrap. Place in a warm place (in the oven with the door left ajar) to proof for one hour. Dough should double. 5. Bring a lot pot (that perfectly fits your bamboo steamer) of water to a boil. 6. 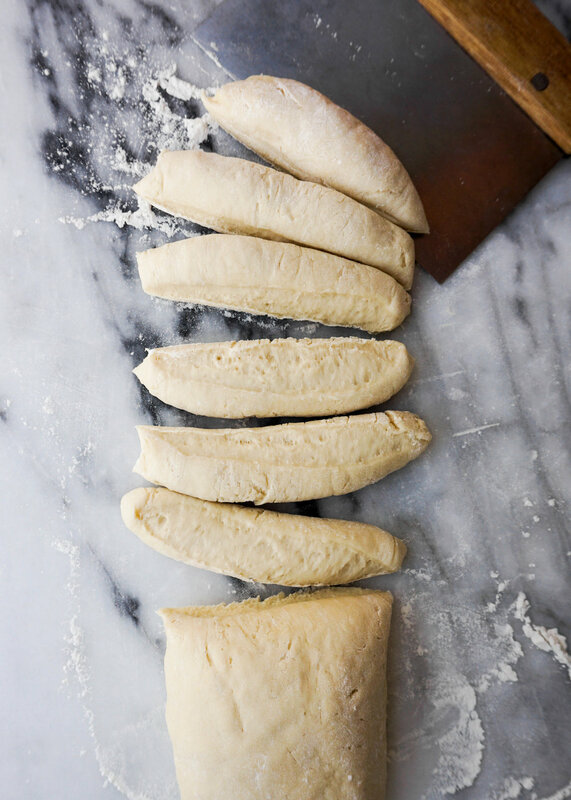 Lightly brush each piece of dough with oil. Fold in half. Brush the top with oil and press into a plate of poppy seeds. 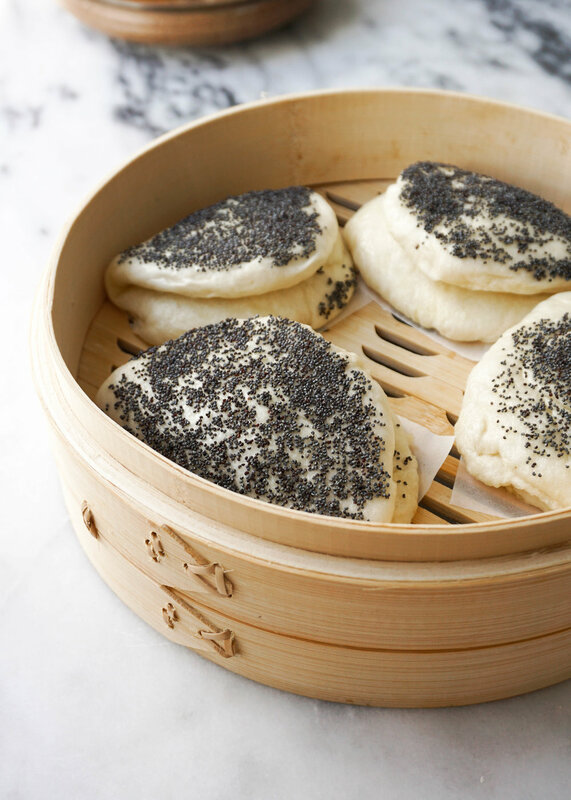 Place the bun on a sheet of parchment and then place into a bamboo steamer. Repeat with remaining buns. 7. Place the bamboo steamer on top of the pot of boiling water and steam for 10 minutes. Once steamed, remove from the steamer and allow to cool on a wire rack. 1. Marinade the chicken in buttermilk for 30 minutes. 2. Beat eggs in a small bowl and combine flour, salt, pepper, paprika, garlic powder, and baking powder in a shallow dish. 3. Dip slice of chicken in flour, then in the egg, and then back into the flour. Place on a dish and repeat with remaining chicken. 4. Add canola oil into a heavy bottom skillet until hot (350 degrees). Add in chicken and fry for 5 to 7 minutes until golden and crispy. Remove from oil and place on a paper towel. Repeat with remaining chicken. 1. Place a piece of fried chicken in a bun, smear on hoisin and Sriracha, add a bit of kimchi and sliced cucumbers, and enjoy!